The town of Anstruther is situated in the County of Fife, Scotland, on the north shore of the Forth Estuary . Anstruther is one of a line of picturesque communities in the East Neuk of Fife notable for their contribution to the fishing industry, especially in the silver days of herring and earlier times of trade with Europe. 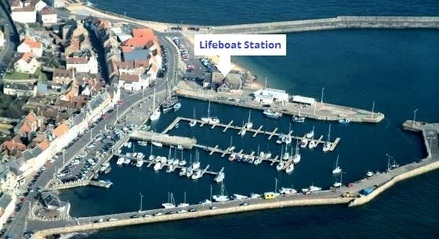 The lifeboat station, founded in 1865, presently has an All Weather Lifeboat - 12 metre Mersey Class Fast Carriage Boat, housed in the boathouse and launched from a carriage at the slip or within the harbour depending upon tide conditions.